Introducing one of the newest services of the pioneer in the spa industry – The Spa Reflexology.Enjoy the best of both worlds – experience healing and relaxationin your own tranquil sanctuary at The Spa Wellness. The Spa Reflexology is a healing massage that focuses on particular “pressure points” of the soles of the feet, where sensory nerves of the internal organs that spread throughout the body are mainly gathered.A different massage experience awaits clients as hands, fingers and a wood stick with cream and oil are used unlike other massages that use thumbs, palms and elbows. If healing is all you want, enjoy a no-frills Reflexology Massage in plush customized chair/convertible bed withsoothing ambiance of The Spa Wellness branches – Acropolis,Trinoma and Greenbelt (Trinoma and Greenbelt soon to open).Cozy rooms with multiple chair/convertible beds equipped with LCD TV screens make it perfect for a Reflexology sparty with friends and loved ones. It’s a sit-and-massage service that lets you begin healing instantly, without the hassle of changing into robes. Licensed and highly-trained therapists work with precision onto the foot to soothe pain and stress. 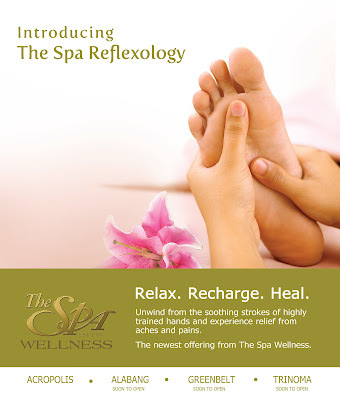 The Spa Reflexology is a 60-minute service for only P550 per session. The Spa is part of the The Spa Wellness group of brands. Pain and stiffness relief caused by too much exercising or using muscle for too long. Prevention and cure of symptoms such as headache, stress, asthma, constipation, sinusitis and migraine. Boosts blood circulation in the system.